Originating in England and evolving from the Black and Tan Terrier, it is the oldest know terrier breed. They were bred to hunt rats and vermin and are still used today to hunt down pests in yards and fields. 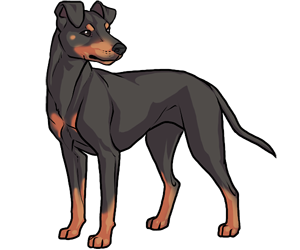 Until 1959, the Toy Manchester and the Manchester Terrier were separate breeds. The main variance between the toy and the standard Manchester are their ear shape. It is the oldest known terrier breed. Used in the development of the Doberman Pinscher and the Airedale Terrier.